Nestled on the Rio Grande River, which serves as a natural border between the state of Texas and Mexico, Brownsville is the largest city in the Rio Grande Valley. With a metro population of 423,300 and by quadrupling the wealth of the city over 15 years, it is no surprise that this city is ranked in the top 100 of Job Growth by Forbes. The only port directly on the U.S. and Mexico border, the Port of Brownsville is a large contributor to the cities economic success. The ship channel leading into the Gulf of Mexico is 17 miles long which allows for easier trade between the two countries. The port typically ships bulk goods and many different materials necessary for manufacturing. The port is also recognized as being environmentally friendly, something they are very proud of. It is a safe and secure location with over 40,000 employees. Another large employer of the region is Keppel AmFELS, an offshore oil rig so large, that is was officially accepted as a “son” of Cameron County in 2005. 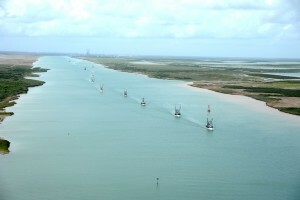 Oil and gas is a vital part of many communities along the Texas Gulf Coast, and Brownsville is no different. Brownsville also makes plenty of money by educating the future of the region. With just under 30,000 student University of Texas Rio Grande Valley employs over 1,700 people. This sister school of UT Austin specializes in bilingual education and biomedical research. UTRGV is also encouraging innovation in the area. The STARGATE Technology Launch Pad is a program under the university’s Division of Research, Innovation, and Economic Development. By applying to the STLP program, startups can receive acceleration and incubation. Blue Box Live is one successful startup coming from the STLP program. The company uses technology to monitor the necessary parameters of MRI units, and notify customers if their units fall out of range of these units. Another major employer for Brownsville is Brownsville Independent School District. Brownsville ISD labels itself an “early college district”and has vastly improved graduation rates and testing scores in recent years. The school district has student populations has almost 50,000 students with 7,500+ employees. SpaceX is a company which involves the top-to-bottom design, manufacturing, and launching of state-of-the-art rockets and spacecraft. The famous project by Elon Musk even has a launch pad just outside of Brownsville. The private company is the only one which has successfully launched spacecraft with a successful return to Earth. With three rockets, the different launches typically gain world-wide attention. Most recently, frightening citizens of Los Angeles who mistook it for UFOs. Brownsville has a subtropical climate, which is ideal for a warm beach day. It’s proximity to the Mexican city of Matamoros, just across the river, as well as South Padre Island make the city a popular place for tourists not only from the state of Texas, but all over. If visitors plan their travels carefully, they can stop by Cameron County’s largest event, the Sombrero Festival which takes place annually in late February. The festival was founded in the 1980s as part of Charro Days Fiesta. Both events are aimed at celebrating the rich cultures of the region with diversity from food to music and dance. Known for being a Hispanic-friendly business environment, though Brownsville may have struggled in the past, the city is well on it’s way to becoming a vital piece of the South Texas Economy. If you are a business owner in the Rio Grande Valley, Halloo can help you better your communications. Find a Brownsville area phone number for your local business. To search phone numbers available in area code 956, click here. This entry was posted in Local phone numbers and tagged Brownsville Phone Numbers by Kristen Gundermann. Bookmark the permalink.